Small knitted woollen mitten. The wool is pale brown. There is a line of black wool decoration around the wrist. Knitting appears to have become common only in the 1500s, but then it rapidly increased in popularity. It was a new activity in working people's lives and soon also became a valuable source of income for many. 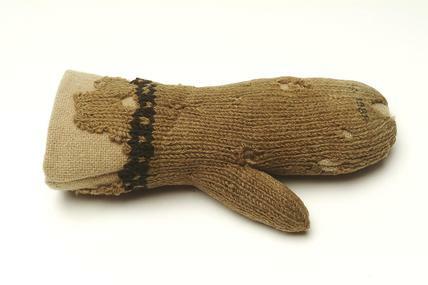 This knitted child's mitten is a rare survival. It is knitted from the top of the finger-pouch in the direction of the wrist and decorated with three rows of black wool in a simple pattern around the wrist. Poorer people could find a bargain at the second hand clothes dealers-'fripperers'- in Houndsditch, but many relied on home-knitted woollen clothes. This garment offers an insight into how children were protected from the cold.